You can delete unnecessary paper textures from your preset list. Click on the Paper Texture tab. 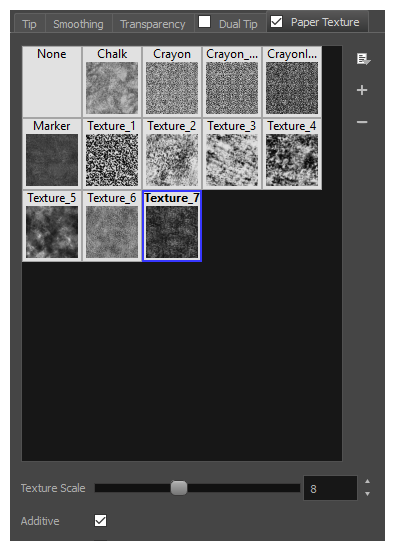 Check the check box in the Paper Texture tab to enable paper textures. Select the texture you want to delete. Click on the Paper Texture menu icon and select Delete. NOTEYou can delete any paper texture in the Paper Texture library, including the default paper textures, as long as no brush preset is using that paper texture. © 1994-2019 Toon Boom Animationc Inc. All rights reserved. Last updated on 04-18-2019.